I recently had to go to the doctor. Nothing major. They just needed to run some tests to determine why I have such a high IQ. You know how it is. Anyway, while I was there I was reminded how much I loathe waiting rooms. I get my impatience from my mother, and let me tell you, sometimes it can be pretty nasty. ONE: I always wait way past my scheduled appointment time. I don’t care how urgent or trivial my medical concerns are. They are never running on time for me. Of course, the lady whose appointment was 45 minutes AFTER mine gets called back before I do, and I sit there twiddling my thumbs and gnawing on the inside of my cheek for another hour. I think even if I was about to give birth in the middle of their floor, they’d still find a reason for me to wait a little bit longer. And if I even DARE to approach the demon-woman behind the counter, all she does is chew her gum at me and say they’ll be with me ASAP…which equates to WHENEVER THIS LAVA FLOW TURNS TO SOLID ROCK. TWO: Everyone stares. Seriously. Even if there’s only one other person in the room, he or she is ALWAYS staring at me. I’m generally always a little self conscious, so naturally I start wondering why this person is trying to burn a whole in my forehead with their eyes. Am I bleeding from my ears? Has one of my limbs spontaneously disconnected from my body and I haven’t noticed? Why are you unable to avert your eyes? 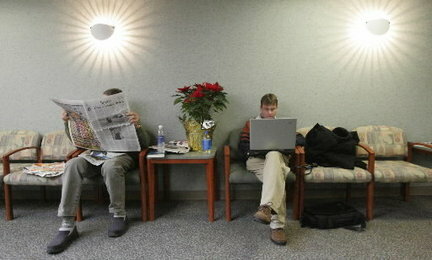 I know that’s why they have magazines in waiting rooms. They know people have issues with staring so they put the magazines there to occupy the eyes. They aren’t there to curb boredom or entertain you with proof that CELEBRITIES ARE JUST LIKE US. THREE: The main reason I stare is because I spend the majority of my overly long wait at the doctor’s office trying to decide which one of these strangers is contagious and what airborne hazard I am unknowingly breathing. If anyone even THINKS about sitting right next to me, I bestow upon them the nastiest of all nasty looks. I’ve even gotten up and moved before. SORRY if I don’t want to sit next to you while you cough up your innards. FOUR: They tease you! I finally hear some chipper young RN call my name. YES! I’M FINALLY OUT OF THIS FORSAKEN ROOM! LOL J/K. She measures how tall I am, because I’m 21 and clearly might have grown since my last appointment 6 months ago. Then she weighs me, because let’s be honest, everyone’s self-esteem needs to be deflated daily. She takes my blood pressure, and asks me an array of questions, most of which are embarrassing. WOO for sharing time. Then she escorts me back to the pit of despair from whence I came, only to sit for another excruciatingly long period of time. FIVE: I have to pay for this experience. It’s like they hand crafted me a rainbow or something. Of course I want to pay a stranger to stick foreign objects into my hoo ha. Here, let me give you a tip, too. You did, after all, tell me that I need to floss more regularly. Who doesn’t deserve 7 figures a year for that? Really, I ought to be billing the doctor for my wasted time. I could be out rescuing beached whales or discovering the cure to restless leg syndrome or something equally profound. This is so funny because I just went through it myself. Waiting for my Mother during a procedure. She ws going tobe sedated and needed a ride home. So, in the waiting room I grab my magazine to avoid eye contact and this old lady sits next to me and proceeds to tell me about being "stuck on the pot" all day. And she wasn't talking about the pot you smoke. The magazine didn't work for me that day.